The Color Cube is our colorful version of the classic Soma puzzle. Seven unique shapes combine into ..
A classic math puzzle that really challenges the mind. The object of Danish Solitaire is to get the ..
Our Marble Solitaire is a combination of the French and English styles of the game. Instructions for.. 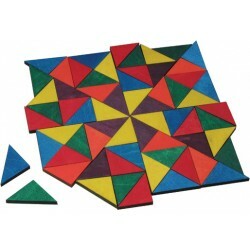 Colorful wooden quarter moons, full moons and other "connecting" shapes can be laid out in limitless.. Colorful wooden triangles in limitless ways for never-ending design possibilities. Triangles measure..
Our version of an old solitaire/strategy game - Pharaoh's Pyramid challenges the player to move the ..
Soma Cube is our clear wood version of the classic three-dimensional solid puzzle. Seven unique shap..